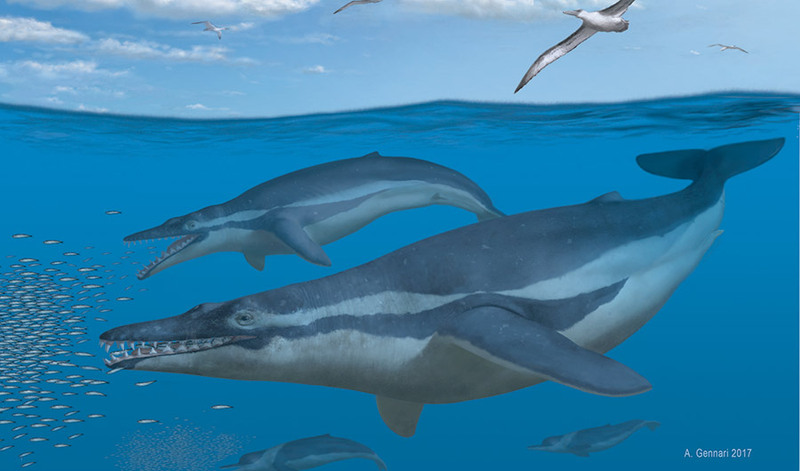 This week, a [paper] came out that described a new fossil whale from South Carolina (USA). The fossil is from the Oligocene (~ 30 million years ago) and it has a basically complete skull, some vertebrae, and a few ribs. A reconstruction of Coronodon by A. Gennari. 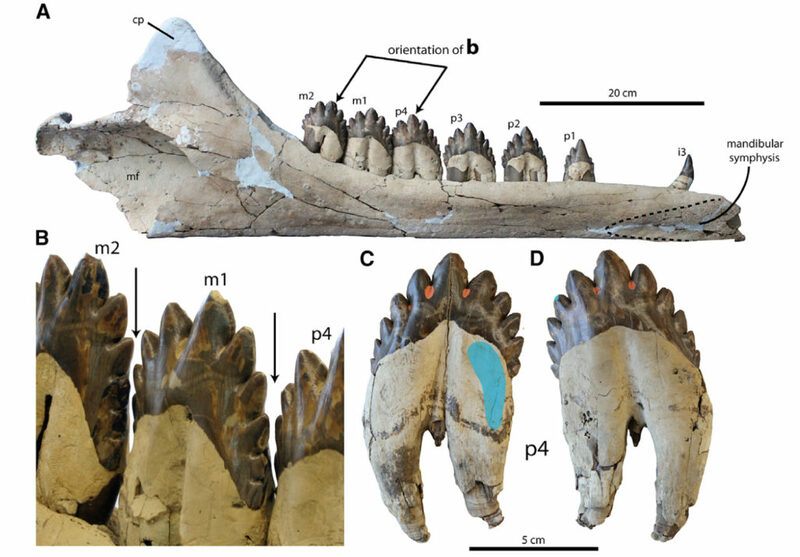 The authors named the fossil Coronodon havensteini, meaning ‘crown tooth.’ It was found by Mark Havenstein, so the specific epithet (the second part of the name) is in his honor. The teeth of this fossil are particularly interesting. Figure 2 from the paper showing the teeth of Coronodon. Instead of simple, conical teeth (like in dolphins), or baleen (like in the blue whale), Coronodon has teeth with many bumps, giving each tooth the appearance of a little crown. Food and other particles left little scrape marks on the teeth, which indicate the direction of water flow through the mouth, and how the teeth were used during feeding. When the mouth was closed, the upper teeth sat on the outside of the lower teeth, providing just enough space for water to escape through the teeth, leaving delicious food bits inside the mouth. 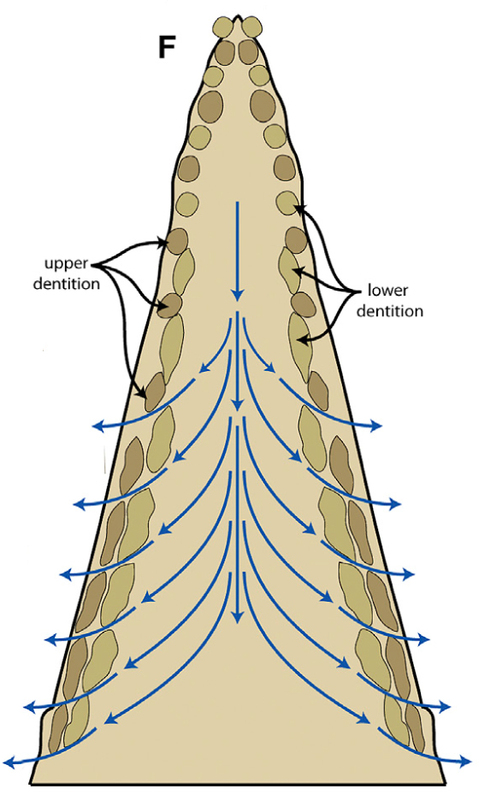 Figure 2f from the paper showing how water would have flowed between the teeth. Coronodon was using its crazy teeth to filter feed! Why is this important? Because understanding how filter feeding began in whales is an ongoing question. Coronodon is one of the earliest relatives of the mysticetes (baleen whales), but it has no baleen itself. It used its teeth the same way mysticetes use their baleen. Later on in mysticete evolution, baleen began to develop and finally took over as the dominant feeding structure. Coronodon represents the first step in that process. Another idea is that whales went through a toothless, suction-feeding phase before filter-feeding with baleen came about, but Coronodon shows that suction-feeding wasn’t part of the evolution of filter-feeding. We can learn a lot about how extinct animals ate their food through looking at the shape and tiny scrape marks on the teeth (called microwear), and Coronodon is new amazing example of that!